Purchased this for my bath over the sink .... Little unsure of the size when I ordered, but it is absolutely perfect..!! The wood trim matches perfectly with the pine walls in the cabin I am building. I love nickle finishes....adds a bit of shine and interest to the room. Was shipped very fast, well packed and in perfect condition. Very pleased and would highly recommend this fixture! Safavieh Lighting Dajana Pendant - Nickle - 10.25" x 10.25" x 11.3-83.3"
Safavieh Lighting Cila Pendant - Grey - 10" x 10" x 12.9-84.9"
Safavieh Lighting Cila Pendant - White - 10" x 10" x 12.9-84.9"
Safavieh Lighting Dajana Pendant - Gold - 10.25" x 10.25" x 11.3-83.3"
Bring industrial chic style to any bedroom, living room, or kitchen with this modern pendant. 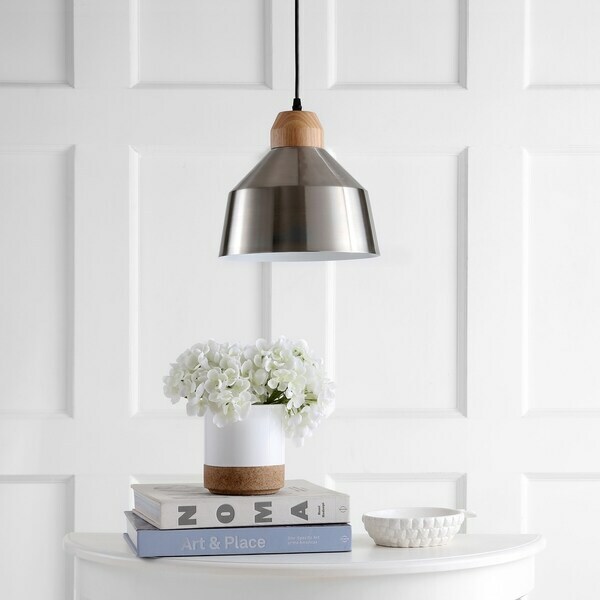 Crafted with a shiny nickel shade and contrasting light brown wooden accents, its sleek design adds just the right amount of contemporary flair. Dimensions 10.25 In. X 10.25 In. X 11.38 In. Gorgeous!!! The size and finish are perfect for our island. I gave 4 stars only because the wood piece that attaches to ceiling is different stain color than the wood on the pendant itself. Really impressed with the quality for this great price! "Hi there, is the wood detail above the shade and the canopy both made out of actual wood or are they metal painted to look like wood?" Yes, this is made from a light brown MDF. Safavieh Lighting Dajana Pendant - Copper - 10.25" x 10.25" x 11.3-83.3"